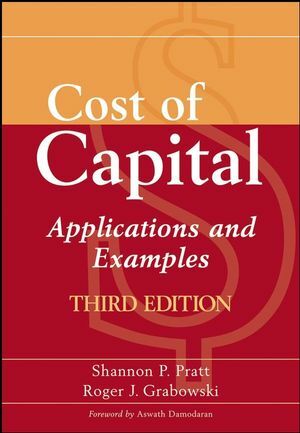 In this long-awaited Third Edition of Cost of Capital: Applications and Examples, renowned valuation experts and authors Shannon Pratt and Roger Grabowski address the most controversial issues and problems in estimating the cost of capital. This authoritative book makes a timely and significant contribution to the business valuation body of knowledge and is an essential part of the expert's library. Shannon P. Pratt, CFA, FASA, MCBA, CM&AA, is the Chairman and CEO of Shannon Pratt Valuations, Inc., and is the founder and Editor Emeritus of Business Valuation Resources, LLC. He is the author or coauthor of several industry standards, including Valuing a Business: The Analysis and Appraisal of Closely Held Companies, Valuing Small Businesses and Professional Practices, The Market Approach to Valuing Businesses, Standards of Value, Business Valuation and Taxes, The Lawyer's Business Valuation Handbook, and Cost of Capital. Roger J. Grabowski is managing director of Duff & Phelps LLC. He has testified in court as an expert witness, including the Northern Trust case, the first U.S. Tax Court decision that adopted the discounted cash flow method to value the stock of a closely held business with the discount rate based on the capital asset pricing model. Roger coauthors the annual Duff & Phelps's Risk Premium Report. He is also the editor of Business Valuation Review. Part I. Cost of Capital Basics. 2. Introduction to Cost of Capital Applications: Valuation and Project Selection. 3. Net cash flow: The Preferred Measure of Return. 5. Relationship between Risk and Cost of Capital. 6. Cost Components of a Company's Capital Structure. 7. Weighted Average or Overall Cost of Capital. Appendix 7.1. Iterative Process Using CAPM to Calculate the Cost of Equity component of the Weighted Average Cost of Capital - Constant Capital Structure. Appendix7.2. Iterative process using CAPM to calculate the cost of Equity component of the weighted average cost of capital - changing capital structure. Part II. Estimating the Cost of Equity Capital "As If Publicly Traded". 10. Capital Asset Pricing Model (CAPM). 11. Proper Use of Beta. 12. Criticisms of CAPM and Beta versus Other Risk Measures. 14. Criticisms of Size Effect. 16. Alternative models to the Build-Up and CAPM models Fama-French, APT, Market derived capital pricing model, Yield-Spread Model. 18. Global Cost of Capital models. 19. Using Morningstar/Ibbotson Associates Cost of Capital Data. Part III. Corporate Financial Officers - Using Cost of Capital Data. 20. Capital Budgeting and Feasibility Studies. 21. Cost of capital for divisions/reporting units. 22. Cost of capital in valuing acquisition/merger. 23. Cost of capital in transfer pricing. 24. Cost of capital in Economic Value Added Financial Management System. Part IV. Cost of Capital for Closely-Held Entities. 25. Handling the Discount for Lack of Marketability For Operating Businesses. 26. The Private Company Discount. 27. Pass-through Entities: Partnerships LLCs and S corps. 30. Minority versus Control Implications of the Cost of Capital Data. 31. How Cost of Capital Relates to Excess Earnings Method. 32. Adjusting the discount rate to alternative economic Income Measures. 33. Equivalence With Alternative Cash Flow Methods For Valuing Companies. 34. Common Errors In Estimation and Use of Cost of Capital. 35. Cost of Capital In the Courts. Part VI. Real Estate and Ad Valorem. 36. Cost of Capital For Real Estate Investments. 36.1 Appendix. Valuing Real Property. 38. Cost of capital in Ad Valorem Taxation. Part VII. Advice to Practitioners. 39. Dealing with Cost of Capital Issues - Advice from the Authors. Appendix C. International Glossary of Business Valuation Terms. Appendix D. Roger Grabowski's Cost of Capital Section in Kohler Report. Appendix E. Developing Cost of Capital (Capitalization Rates and Discount Rates) Using ValuSource Valuation Software.